This post contains affiliate links. If you purchase a product using the links in this post, I do earn a small commission. Thank you in advance if you decide to use my links! 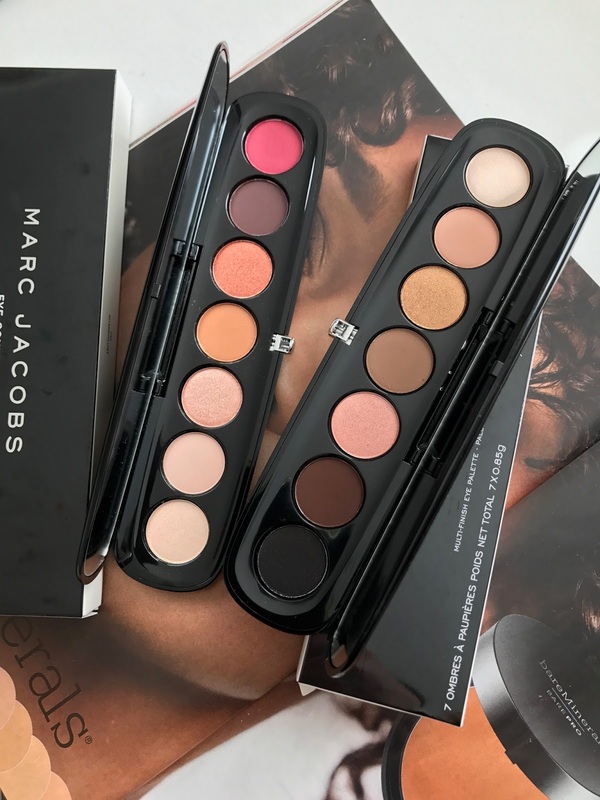 Today I have just a quick review and look at the second of the Marc Jacobs Beauty Eye-Conic Palettes I picked up for my birthday in Scandalust. FYI - I found this palette a bit disappointing and did not keep it. For the price of $49 per palette, I didn't want to keep a palette that didn't completely wow me. And, it's not that I think this a terrible palette, but the two shades I was most excited for were not as good as I expected them to be. As stated above, these Marc Jacobs Beauty Eye-Conic Palettes are $49 and there are six palettes in the collection. When I first saw Scandalust, I immediately zoned in on that red shade. 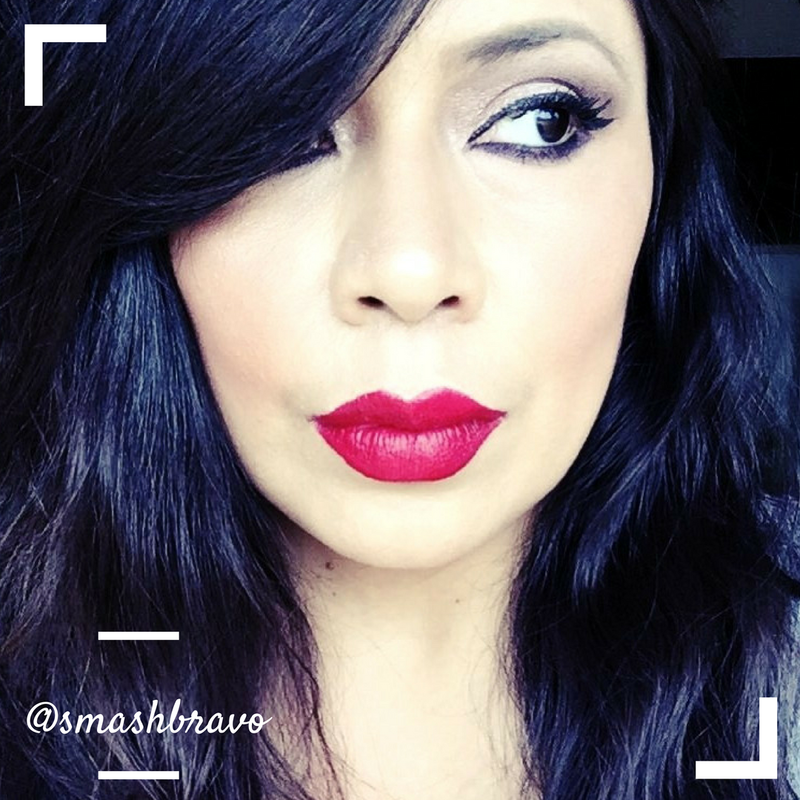 That was the shade that I could not wait to try and the shade that I really feel makes Scandalust stand out. I wasn't even super excited about these first 3 shadows - thinking they were kind of bleh. But when I started my swatches, I had to stop after those initial three and share on IG and SNAP how amazing they were. Here was that amazing Marc Jacobs formula that I love, the buttery, beautiful shades were exactly what I was expecting. Then there is that mid-tones brown which was nice and a gorgeous shimmer shade next to it that is super buttery and pigmented. (These shades do have names but since I no longer have the palette, I don't know what they are). The last two shades, the ones I actually liked the most, were disappointing. I was doing these swatches live so I was able to share how the brown shade got super crumbly and dusty once I put my finger into the pan. And of course I did this lightly, these were my birthday gifts and there is no way I would ever dig my finger into any pan. The payoff of this shade is also lighter than I had hoped. The red shade, Scandalust, was exactly the same. This one wasn't soft and powdery just not pigmented and a little patchy. Even with the problems that I had swatching this palette, I would not say no to repurchasing it, but it would be when I can get it on some type of sale or discount like the Sephora VIB sale. I loved the first three shades so much! If there was a palette with just those shades and the mid-toned brown, I would buy it in an instant. 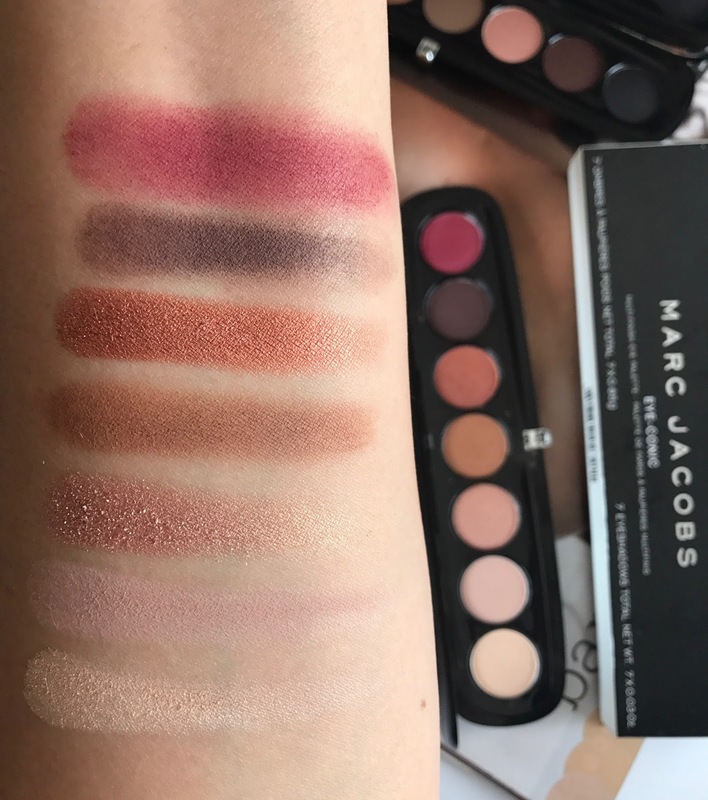 My experience with this palette won't be the same of a regular consumer who purchases the Marc Jacobs Beauty Eye-Conic Multi-Finish Eyeshadow Palettes. Regular consumers won't swatch and potentially ruin their palette, that's just something bloggers do that really depreciates the value of our product. But we do it to show you the shade, the color payoff and shadow finishes of a palette. But a regular person won't have to do that and maybe their shadows won't get destroyed. Somebody else can buy this palette and get beautiful, full-pigmentation from all of the shades. I am just sharing my particular experince which was a surprise because I own the 2016 Holiday Marc Jacbos palette and love it. I was as surprised as anyone that all of these shades were not 100% amazing. I did wear this palette on my eyes on two occasions but I was still not 100% happy with the pigmentation on the red shade. That is the reason why I returned it. Again for the price, I wanted to be happy with every shade, especially that one. But I love the second palette I picked out called Glambtion, that one is 100% amazing and worth the price, IMO. You can read my review of that palette HERE. This won't be my last dip into these palettes, I am sure when the holidays roll around and the Sephora VIB sale, you will see me buy at least one more. Purchase the Marc Jacobs Beauty Eye-Conic Multi-Finish Eyeshadow Palette in Glambition at Sephora.